Life can sometimes be unfair. This is the shocking story of Nicholas Musyoka Kalela, a soft-spoken, tall and slender man who is the fifth born in a family of six. 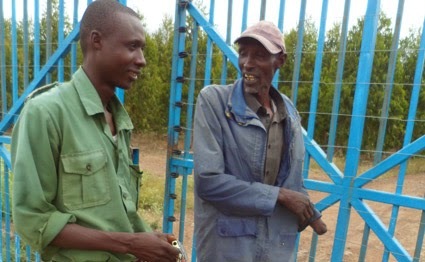 For the last one-and-a-half years, Nicholas has been working as a watchman at Gicheha Farm in Juja, Kiambu County, which is said to be a part of the Brookside Dairies Company. The job pays him a monthly salary of Sh5,600 with allowances totalling to Sh1,000. This gives him a total of Sh6,700. With this he is expected to take care of himself and also support his parents and a sister, who is in Standard Seven. Nicholas was born on October 10, which was then known as Moi Day, in 1989 and has four brothers and two sisters. Apart from the lastborn, the rest have completed primary school education. At some point my elder brother Thomas Munyao had to drop out of school for me to continue because I was doing slightly better than him and there was money enough for fees for only one of us. He joined my parents in casual employment and to date his life is miserable,” says Nicholas. At the age of six, Nicholas joined Kunikila Primary School. On passing his Standard Eight exam, he was admitted to Kunikila Secondary School. He did his Kenya Certificate of Secondary Education (KCSE) exam in 2010 and scored a B plain. He scored good results – English C+, Kiswahili B+, Mathematics B+, Biology B, Chemistry B, Geography C+ and Agriculture B+, an aggregate a B of 62 points. Unfortunately, he was not admitted to any of Kenya’s public universities, as the cut-off mark was 64 points in 2011. But he has a letter from The Presbyterian University of East Africa in Kikuyu that he really treasures. It was an admission to study a Bachelor of Business Administration (Management) course in the university’s School of Business Studies. The first semester Fee, tuition plus administration charges, was Sh67,000. Boarding would have cost him Sh38,000; a total of Sh105,000 per semester. It was far beyond the family’s dreams. "Our cry as a family is that we have suffered enough and hope we will one day get out of these problems. I hope to realise my dream in education, assist my younger sister Winfred to also complete her secondary school education and go to college as she is quite bright in class,” Nicholas says.